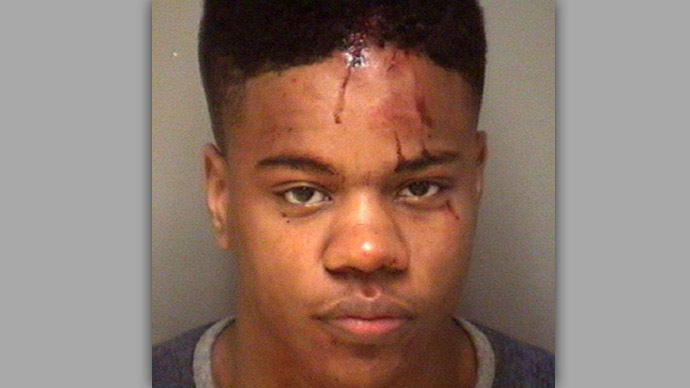 Up to 1,000 students gathered at the University of Virginia on Wednesday night to rally against the "animalistic, insensitive, and brute handling" of Martese Johnson, a black undergrad who sustained a head injury during an arrest, requiring 10 stitches. Virginia Governor Terry McAuliffe has called for an investigation into the early-morning Wednesday arrest of Johnson, 20. The third-year honor student is majoring in Italian and Media Studies and holds a number of leadership positions at the school. A photo in which Johnson's face is heavily bloodied and the video of the disturbing incident has been widely shared among social media users. According to Charlottesville General District Court records, Johnson (who has no criminal record) was charged on two counts: obstruction of justice without force and public swearing or intoxication. The Alcoholic Beverage Control (ABC) agent who made the arrest, J. Miller, indicated in the arrest report that Johnson "was very agitated and belligerent." Bryan Beaubrun, a third-year student who said he witnessed the incident, said an ABC agent reached Johnson shortly after the bouncer at Trinity Irish Pub asked him to step aside after refusing to accept his ID. The arrest took place shortly thereafter, according to Beaubrun, when Johnson was talking with a group of ABC agents and Charlottesville Police officers. They could have killed #MarteseJohnson that night and he wouldn't have lived to tell his side. A statement from the Black Student Alliance (BSA) also claims Johnson's arrest was totally unjustified. Their Facebook page stated that "a mass of University students bore witness to the officer’s animalistic, insensitive, and brute handling of Martese." "His treatment was unprovoked as he did not resist questioning or arrest. In confusion, with blood painting his face and creating a pool on the bricks of the corner, he yelled out for mercy. Though he lay bleeding and crying out, officers continued to hold him to the pavement, pinning him down, twisting his arm, with knees to his back until he was handcuffed," BSA said. Johnson's lawyer, Daniel P. Watkins, released a statement Wednesday night saying that his client "is absolutely devastated" by what happened. "We are preparing to investigate and defend this matter vigorously," the lawyer pledged. The ABC said the agents involved with the arrest of Johnson are being restricted to administrative duties while a state police inquiry is underway. Last year the state of Virginia reached a $212,500 settlement with a UVA student who was arrested after her purchase of water was mistaken for beer in 2013. Elizabeth Daly was charged with eluding police and assaulting an officer after her SUV grazed two of the agents. The charges were dropped after the student's arrest caused a public outcry. Johnson is due to appear in court on March 26. He is charged with a class one misdemeanor and a class four misdemeanor. According to the Code of Virginia, a class one misdemeanor may carry a penalty of a jail term for no longer than a year and a fine of $2,500 maximum, either or both, while a class four misdemeanor goes with a fine of $250 max.